(01-04-2019, 06:53 AM)Bighead Wrote: You must set up your controller extension as a "Classic Controller" and not Nunchuk. It was already set up on classic, otherwise HD textures for buttons controllers will not work too. That's the point i can not understand: if controller's textures are loaded, tutorials should load too. here, i tried to use hd textures in 1080p and not 2160p to save RAM (i was at 6Go/8Go with 2160) but it didnt work :/ . It doesnt matter, dont loose your time here! There is a possibility I have the wrong tutorial textures with the buttons, I'll take a look later. Quick question: which controller/tutorials pack are you using? Xbox? PS? Switch? Second question: are you using standard or "legacy" version of pack mentioned above? Edit: Also I forgot to mention, not all tutorials have been done (I think i made 112 and there are over 180). So if some are loading and others are not, it could be because no HD version exists. But if none are loading, then that is a genuine problem. I dont think so, i tried all of them. i wonder what can block the loading of these tutorials. I was currently using standard Xbox One package. Nope, all of thems are old. I even tried to put my game in english instead of french, but did not work too (i tough that every versions of the game got different tutorials because they have IG screenshot in the native language). Hello all who work on Xenoblade's HD texture pack. I put my Monado optional textures as Charcoal with green FX, however the FX doesn't show up in cutscenes. I dragged the whole Weapons folder over, including the cutscene folder in MonadoFX. So why does the FX not show up as green? Thanks to whoever can help me out! Edit: The beam seems to sometimes be blue and sometimes be yellow in cutscenes, and yellow in battle. What was the logic for reversing the X/Y and A/B buttons for the Xbox controller? Isn't the whole purpose of that texture pack to correct the layout? The Legacy pack only half-fixes it, so that's not an option either. (01-07-2019, 03:14 AM)DarkShinyGiratina Wrote: Hello all who work on Xenoblade's HD texture pack. I put my Monado optional textures as Charcoal with green FX, however the FX doesn't show up in cutscenes. I dragged the whole Weapons folder over, including the cutscene folder in MonadoFX. So why does the FX not show up as green? Thanks to whoever can help me out! I can't remember exactly because it's been years at this point, but a contributor named "narcku" was one of the first (and maybe only) people to try to modify the monado textures during cutscenes. From what I remember, he could not find the textures for every cutscene, or they didn't dump, whatever it was something prevented from having correct monado retextures in every single cutscene. Since then, every variation of cutscene textures was most likely modeled after his initial implementation. (01-08-2019, 01:35 AM)JoostinOnline Wrote: What was the logic for reversing the X/Y and A/B buttons for the Xbox controller? The Legacy pack only half-fixes it, so that's not an option either. The logic of reversing them is that they are logically reversed. A=B, B=A, Y=X, X=Y. Microsoft's buttons are literally reversed from Nintendo's. To satisfy Microsoft layout is to break the nintendo layout and you would get some funky controls. The custom tutorials should compensate for the buttons being reversed. If set up correctly, you will have identical controls to what Monolithsoft wanted you to have with the classic controller, despite the assignment of letters. (01-08-2019, 01:35 AM)JoostinOnline Wrote: Isn't the whole purpose of that texture pack to correct the layout? The Legacy pack only half-fixes it, so that's not an option either. The normal button packs do have the correct layout as far as button position goes. They are 100% accurate to a classic controller plugged into a real wiimote (I know, because I own both). All controller packs mimick the classic controller button positions, not how the buttons are labeled. The "legacy" version is meant to not have the correct layout. It was made at a time by someone who thought "Hey, I like it this way" and made it into a button pack, before there were any other button packs. This button pack got quite popular, but it required moving the buttons to positions that are not how the game was designed. I called it "Legacy" because it was old, incorrect, and I was eventually going to phase it out. But it still gets enough downloads to keep it into existence. (01-08-2019, 02:24 AM)Bighead Wrote: The logic of reversing them is that they are logically reversed. A=B, B=A, Y=X, X=Y. Microsoft's buttons are literally reversed from Nintendo's. To satisfy Microsoft layout is to break the nintendo layout and you would get some funky controls. The custom tutorials should compensate for the buttons being reversed. That doesn't really work if you want consistency across games. If people want the Nintendo layout then they use the Nintendo controller. Every other system and mod maps the textures to the correct button. This just leads to more confusion IMO. Anyway, your Classic Controller ones are correct, so I'll use those. Appreciate it. I just prefer my good old Xbox One controller. 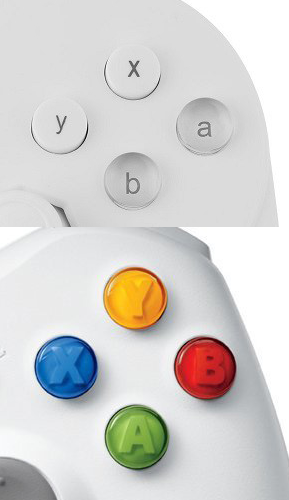 Nintendo switches the X and Y buttons and the A and B buttons compared to Microsoft. It is already confusing enough to read A but to use B. I rather stick to the XInput control scheme, since I am just to that outside of Dolphin too. (01-08-2019, 05:06 AM)JoostinOnline Wrote: That doesn't really work if you want consistency across games. If people want the Nintendo layout then they use the Nintendo controller. Every other system and mod maps the textures to the correct button. This just leads to more confusion IMO. Anyway, your Classic Controller ones are correct, so I'll use those. Appreciate it. I don't care about consistency across games, I care about the controls being correct in this game, which they are. If other games/mods do it a different way, then that is their decision. (01-08-2019, 05:06 AM)JoostinOnline Wrote: That doesn't really work if you want consistency across games. This just leads to more confusion IMO. Are modders changing the default layouts of their games based on the controllers people are using? IMO, that's more confusing than anything else. It's good to have multiple setups for people's preference, but the default option should always match the same layout as the original game. (01-08-2019, 05:06 AM)JoostinOnline Wrote: If people want the Nintendo layout then they use the Nintendo controller. Every other system and mod maps the textures to the correct button. Really not true. Most multi platform games generally leave the button in the same position. If the menu button is X on nintendo, then it is Y on XBox and Triangle on Playstation. It will always be that top button. If Jump is B on Nintendo, then it is A on Xbox and X on Playstation. Always the bottom button. Almost nothing I've ever seen matches to letter rather than position, since that really only works with XBox and Nintendo anyway. We made the call to keep the position of the buttons correct since that's the way the game is designed, and one of our objectives with this pack was to try to keep it as similar to the original as possible. As noted, the legacy pack does sort of "fix" this halfway, since whoever made the first set of button retextures apparently played this way so a lot of users got used to the setup. Contrary to your opinion, I think it's way less confusing keeping the default setup accurate to the original setup - although I actually prefer the buttons setup how you have them. But we wanted to keep the pack as accurate to the original as possible. Technically, anybody could make them whatever buttons they wanted to by remapping the controller in Dolphin settings and switching the file names of the textures.